British horticultural writer Patrick Taylor’s beautifully photographed book, Making Gardens, might be more aptly titled, Visiting Gardens. Displayed against a backdrop of castles, walls, pergolas, and Grecian urns, the gardens he chooses are truly spectacular. He offers horticultural and design tips, emphasizes the importance of good structure (‘bones’) in the garden and focuses on varying site challenges, from an elegant London roof garden to Beth Chatto’s Mediterranean gravel garden. 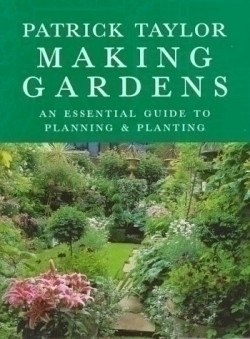 However, he fails to deliver on his stated purpose: “to encourage gardeners to think about the design and planting of their gardens & to inspire gardeners to have confidence to plan their own design.” Most gardeners would be intimidated rather than inspired by the layouts and hard structures in this book. How can an elaborate parterre and a 17th century stone wall relate to the average gardener, particularly one on a shoestring budget? No, this is not a design primer for the beginning gardener, particularly one who lives on this side of the Atlantic. Taylor’s plant palette uses shrubs and perennials that thrive in England’s mild climate, not in the hot summers and cold winters of mid-America. Of the plants featured in the book’s glossary, a great many are completely incompatible with the soil and climate of American gardens. If it’s an inspirational garden that you’re seeking, Making Gardens is the book for you. If it’s practical advice on the design and layout of your perennial border, you’ll need to look elsewhere. Taylor would intimidate most gardeners from ever putting their shovels in the soil.